The Pecan Street Festival brings artisans, performers, food and fun to 24 city blocks in Austin’s Sixth Street Historic District for the 36th year! This longstanding Austin tradition is the most anticipated free, family and pet-friendly festivals year after year. It happens this weekend, Saturday May 3 from 11 am to 10 pm and Sunday May 4 from 11 am to 8 pm. The Pecan Street Festival attracts thousands of locals and visitors each year and raises money for Austin area non-profits. Every conceivable opportunity for family-friendly revelry and merriment is abundant at the festival. Enjoy live music, food, circus/street performances, art demonstrations, inflatable amusement for kids, face painting, ogling the latest gadgets and automobiles, artisan goods to eat, wear or admire, free samples, and great handmade shopping. If revelry and merriment aren’t your thing, you’re still in for some great people watching. WIN! Enter to win Do512Family’s Pecan Street Gift Card giveaway by logging in and liking this event on the Do512Family calendar here. 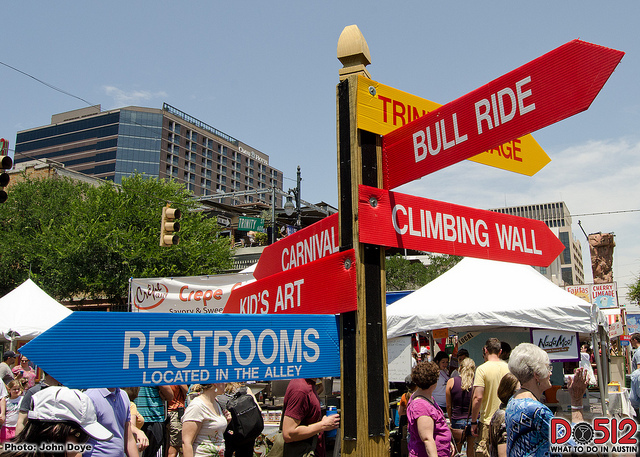 To have the most enjoyable time at the Pecan Street Festival, plan ahead! Download a PDF of the event map and vendor booth list here. Why bother figuring out parking when you can just ride the bus, or the MetroRail in? Plan your trip on the bus or train here.